The Mitsubishi FDTC35VF Compact Cassette Air Heat Pump - Air Con Unit is fitted into small shops etc to provide conditioned air throughout the year, be it in cooling or heating mode. They are normally recessed into 600mm ceiling grids with a minimum of 270mm depth to give an uncluttered look. The indoor unit air outlet louvers can be set at different angles on each of the 4 sides of the indoor cassette to provide optimum comfort. 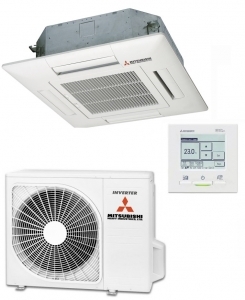 This model the FTDC35VF comes with the indoor cassette unit with hardwired controller and outdoor unit. We also sell a full range of fitting items should you require them to install this system.